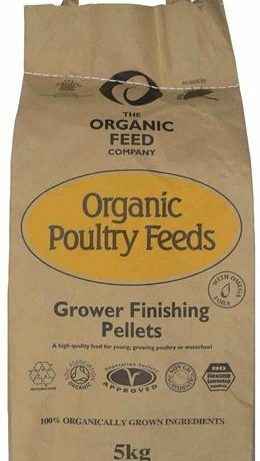 Organic Poultry Grower/Finisher is an ideal feed from 6-8 weeks up until 16 weeks or to finish. Feed on an ad lib basis. For birds that are to be kept as laying hens, introduce Organic Layers Pellets gradually from 16 weeks. Available in 5kg and 20kg bags. • There are no synthetic vitamins or minerals in this feed. • The Organic Feed Company only source identity preserved (Hard IP) Non-GM ingredients. • The Organic Feed Company feeds are made from natural ingredients which can result in the feed changing colour slightly through the seasons. Feed ad lib from 4-8 weeks (about 100-150gms per hen per day) all year round. Introduce a new feed gradually over 7 to 10 days to help a smooth change over. This feed should be fed with ad lib fresh water and grit should be made available at all times. For good strong egg shells and optimum nutrition, treats should only be fed in the afternoon, after your chickens have eaten their pellets and no more than an egg cup full (around 20g) for each bird should be given.